Before undertaking any major Agile adoption, it is important to ensure you both understand your challenges and the best way to solve them. There is not only no one-size fits all, but even when you know what “size” to use, the order of its adoption may vary based on your culture, who is leading and the extent of certain challenges. The following are appropriate for virtually all companies about to undertake an adoption of Agile methods. Perform a two day to two week assessment of challenges and create an initial challenge-response map. Have the sponsor and their key stakeholders and influencers, take a two hour introduction to the approach being undertaken and how it fits into the challenge-response map. Have leadership, product management, and the PMO, take a one day leadership overview of Lean-Agile Product Management and how it fits into the challenge-response map and discuss the Lean-Agile practices that should be adopted. What the company should invest in. Doing this will help resolve conflicting requirements that occur further down the value stream. Provide three days of product management workshop/coaching starting with the selection of a pilot initiative that will affect most of the teams, and working with Product Managers, business analysts, and Product Owners, as applicable, to craft thin-slice requirements from the initiative-level all the way to team-level stories. All Scrum Masters and their manager(s) should start the Coaching Academy for Scrum Masters and Agile Team Coaches to supplement the upcoming training. Deliver the Scrum with Agile Requirements workshop (plus the SAFe add-in module if needed) to everyone in the pilot using the thin-slice requirements from the prior step as input for the workshop. FLEX will support an iterative model where teams plan separately, or an iterative model where teams plan together (like SAFe) or even a pure flow model. To get things started, a two day planning event focusing on collaboration, identifying depedencies and making agreements with each other is important. 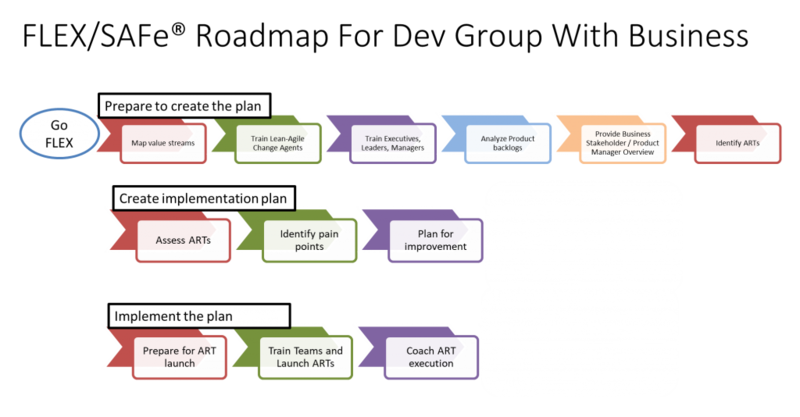 Provide three weeks of follow-on coaching for the development teams and for product management to do the following. Help to implement these items. Conduct a one day pilot review workshop for leadership, product management, and the PMO to demonstrate outcomes, retrospect the effort, and discuss next steps. Provide Agile Software Development training (Design Patterns, TDD or Emergent Design) for architects and team leads who develop code. In addition we include our online, self-paced course Foundations of Sustainable Design for all developers in the pilot at no additional cost. If your organization is already doing SAFe, you can learn more about how FLEX can help both simplify SAFe while making it more effective. For more, see Using FLEX to Enhance SAFe. Roadmaps need to be adjusted for who is driving, who is involved, what the culture of the organization is and where they are. The following figure shows a starting roadmap before being tailored for these factors.